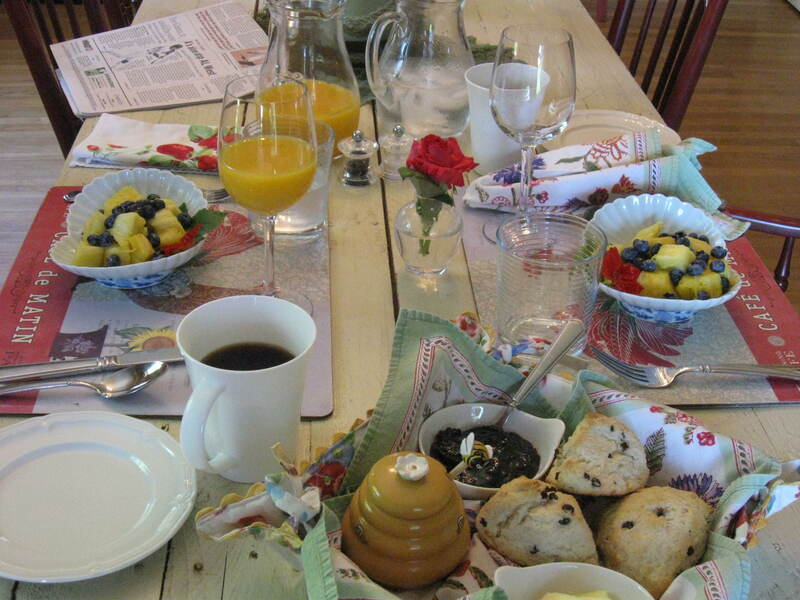 I’ve reviewed hundreds of bed-and-breakfast inns for guidebooks, and by now it takes me maybe two minutes to tell if I’ve found a good one. As I walk in the door of The White House Bed and Breakfast, in Medford, Oregon, I know immediately it rates high on the list. Kathy Rulon greets weary travelers with a smile, shows us to our spacious upstairs room, explains how things work, and points out a box of cards with breakfast menu choices (nice idea!). Then she leaves us alone in our haven of quiet, saying “I’ll be in the kitchen or garden if you need me.” Kathy is a former flight attendant, and she knows how to take care of people without any annoying hovering. 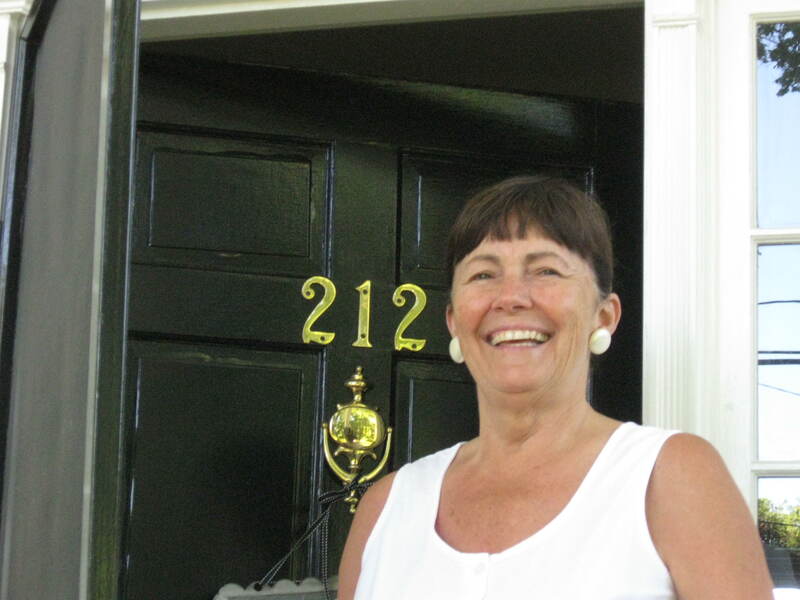 Her relaxed, friendly style makes guests feel immediately at home, and this, plus nice accommodations with thoughtful touches, are to me the ingredients of a perfect bed-and-breakfast inn. Reasonable rates help, too. 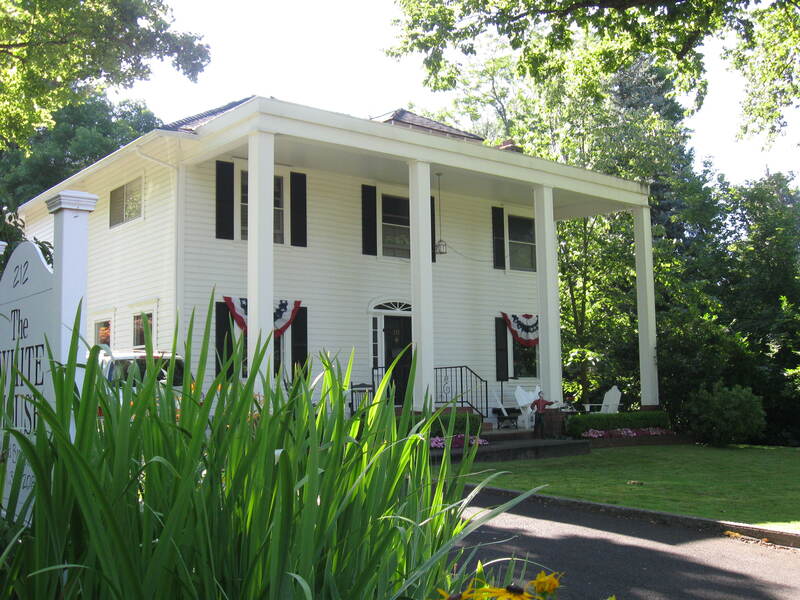 The White House B&B is a two-story, columned home on a residential hillside lane in East Medford. It’s white, of course, and has a veranda complete with inviting rocker. Our room is actually a suite stretching across the house front to back, with windows overlooking the tree-shaded street and large garden. 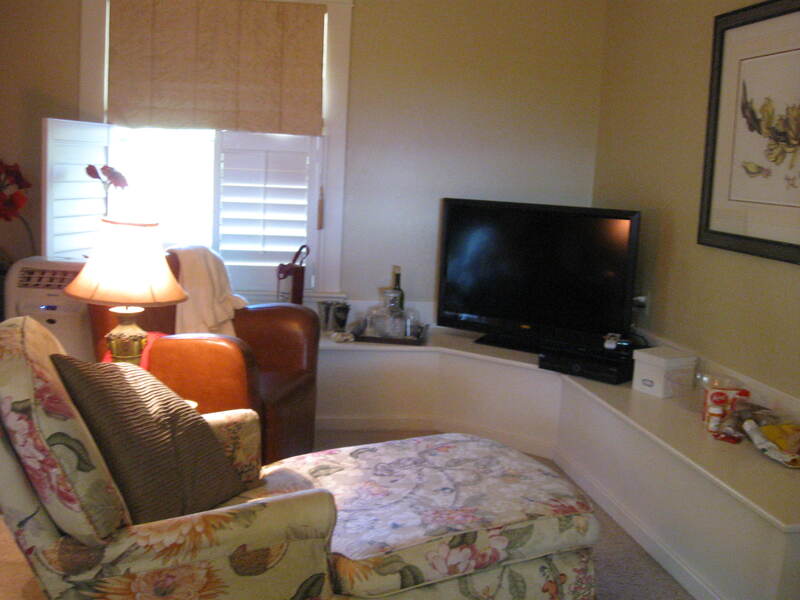 The queen-sized bed is comfortable and the light-filled bathroom spotless. And there’s plenty of space to put our stuff, which inevitably gets scattered around. Down the hall is another bedroom that sleeps two, but it’s used only if a group is traveling together, so we have the entire floor to ourselves. Asked for a dinner recommendation, our hostess is happy to oblige. We choose Porters, a century-old train station restored as a popular restaurant. 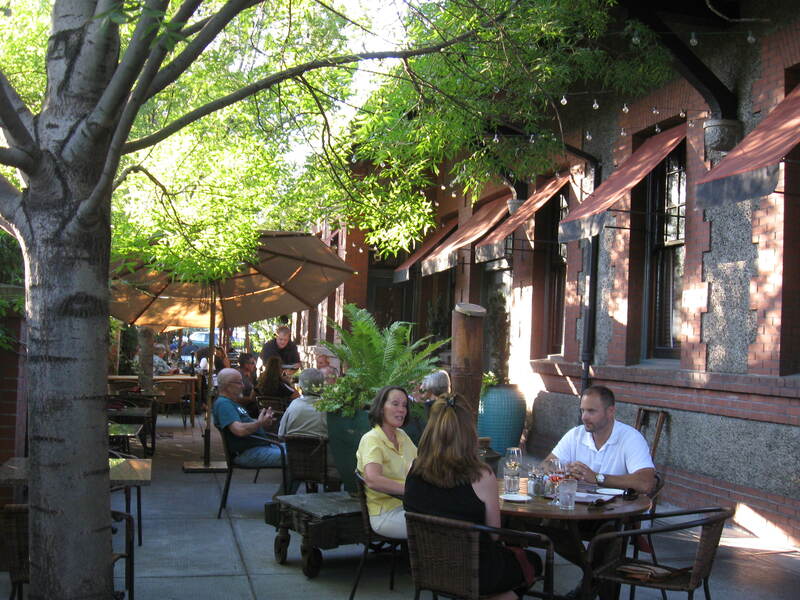 It has both historic charm and an excellent menu of American classic dishes, emphasizing local foods: wild mushrooms, herbs, cheeses, Northwest seafood and wines, Oregon poultry and lamb. We dine at an outdoor patio table, with train tracks on the other side of the vine-covered fence, and couldn’t be more content. In the morning, Kathie has breakfast on the table at the time requested. 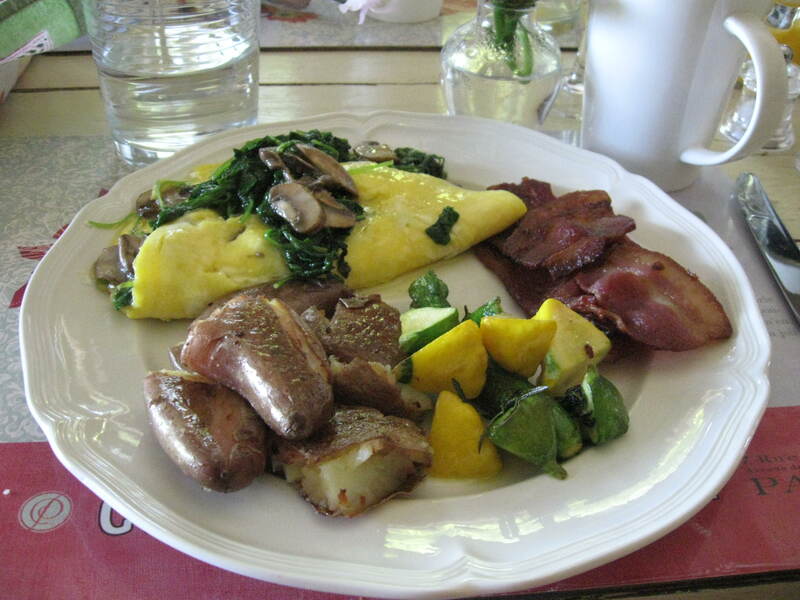 We have the granola/fruit/yogurt parfait and a spinach-mushroom omelet, only part of a small feast that includes whole cooked pears, fresh coffee cake and preserves, juice, coffee and teas. It’s all delicious. (Kathy’s secret to a perfect non-rubbery omelet: cook it more slowly than you think you should.) Her most requested dish is the Dutch Baby, a baked pancake cooked at high heat in a heavy cast iron pan so it crawls up the sides. Kathy fills it with blueberries and gives it a sprinkle of powdered sugar. Search as I might, I can’t find a thing to complain about, so I’ll end with the recipe that made Kathy a finalist in a Best Breakfast contest by BedandBreakfast.com. It’s easy to prepare if you roast the sweet potatoes and yams the night before, which I did. Also, I skipped the eggs and it was uniquely tasty anyway, a good, hearty brunch dish. Roast sweet potatoes and yams. Cool, peel, and cube. Sliver onion and sauté with potatoes and yam in olive oil. Cut stems from beet greens; sauté greens lightly in olive oil. Fry bacon, drain off most of fat, and add syrup and brown sugar. Cook on low heat for 5 minutes. (Pinch of cayenne pepper here is optional.) Spread onto baking sheet to cool; then break into pieces. Lay a bed of the beet greens on each plate. Place a spoonful of potato/yam/scallion mixture on top. Sprinkle with bacon/sugar brittle and top with 2 poached eggs. Garnish with a scallion.